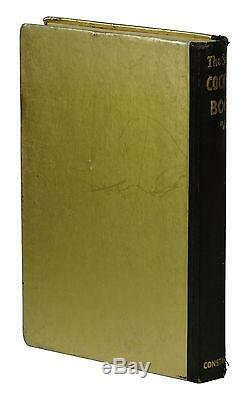 First Edition, First Printing First Issue Signed by the Author. London: Constable & Company, LTD. First issue with number on title page and errata slip tipped in at page 25. 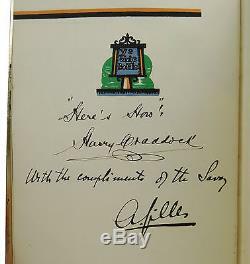 Signed by Harry Craddock, inscribed "Here's How" and "Complements of the Savoy". Good, with paint speckles to front cover and spine cloth, scrape across title on front cover, cloth at front gutter has started to split and is frayed along the spine ends, foxing to edge of page block and lightly throughout. 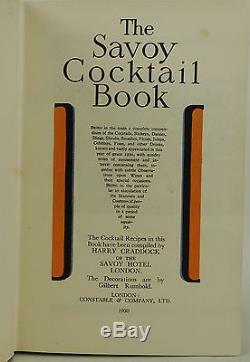 The item "SIGNED The Savoy Cocktail Book HARRY CRADDOCK First UK Edition 1st Issue 1930" is in sale since Wednesday, July 11, 2018. This item is in the category "Books\Antiquarian & Collectible". The seller is "burnsiderarebooks" and is located in Portland, Oregon. This item can be shipped worldwide.